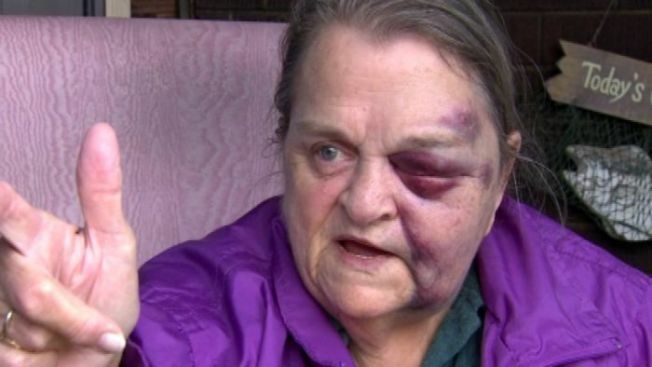 A 67-year-old grandmother was left with a closed and swollen black eye after fighting off a group of armed teenagers who wanted to steal her van. Kay Kise from Indianapolis was getting home from some Christmas shopping at about 7 p.m. Sunday when a teenager approached her and asked for directions, NBC affiliate WTHR reported. As that happened, two others walked down the street towards her. “The next thing you know, I turned back around, and he had this gun right in my face,” Kise told the station. During the confrontation that followed, she yelled for help and caught the attention of her 13-year-old neighbor Shantel Johnson. Johnson saw Kise bleeding and called her mother, who was upstairs. “I was like, ‘Mom, Mrs. Kay is hurt! Mrs. Kay is hurt,’” Johnson told the station. The teenagers left long before the police arrived to the scene of the attack. Paramedics took Kise to the hospital to check for internal bleeding. Now, Kise hopes her attackers are brought to justice.